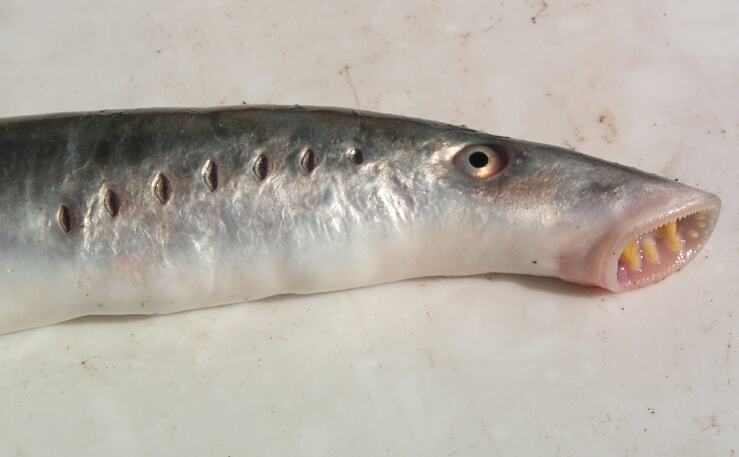 "Agnatha (Greek, "no jaws") is a superclass of jawless fish in the phylum Chordata, subphylum Vertebrata. The group excludes all vertebrates with jaws, known as gnathostomes." "The oldest fossil agnathans appeared in the Cambrian, and two groups still survive today: the lampreys and the hagfish, with about 100 species in total." sensitive pineal eye (homologous to the pineal gland in mammals). All living and most extinct Agnatha do not have an identifiable stomach or any appendages. Fertilization and development are both external. There is no parental care in the Agnatha class. The Agnatha are ectothermic or cold blooded, with a cartilaginous skeleton, and the heart contains 2 chambers." "Agnatha were prominent among the early fish in the early Paleozoic." The brains of lampreys and hagfishes: characteristics, characters, and comparisons. "A comparison of the brains of lampreys and hagfishes is carried out in an attempt to reconstruct the anatomy of the brain of the last common ancestor of craniates: i.e., the morphotype of the craniate brain. This brain consisted of tel-, di-, mes-, and rhombencephalic divisions; the presence of a metencephalic/cerebellar division is questionable. All major sensory and motor systems (with the possible exception of the oculomotor system) that are typical of craniates were present in the morphotype. There were extensive bilateral secondary olfactory projections to the telencephalic pallium, as well as bilateral retinofugal projections to diencephalic, pretectal, and tectal targets. The rhombencephalon was subdivided into dorsal (viscero- and somatosensory) and ventral (branchiomotor) zones. The spinal cord projected to most rhomb- and mesencephalic areas; in turn, it received descending projections from the mes- and rhombencephalic reticular formation and from the octaval nuclei." The spinal cord > reticular formation > spinal cord loop may be an example of initiation of behavior by the rhombencephalon. Full length, 11 page PDF.